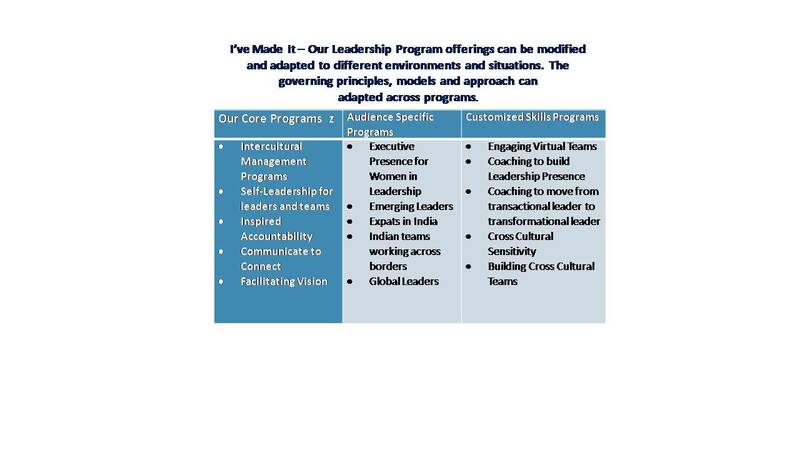 To learn more about our leadership programs contact us. In the fast pace of the 21st century, everything becomes redundant fast. Hence today’s business success stories are from frugal innovation, dynamic young entrepreneurs, companies who disrupt the status quo and grow quickly such as Uber and Airbnb. As technology surges onward, the need for leaders to be influencers, thought leaders, and great communicators intensifies. Due to globalization, new norms have come into play and there has been a major shift from hierarchical to flat collaborative team structures. Flattened structures mean more interpersonal connections which are intentional, influential & impactful. Leadership doesn’t create more followers, but more leaders. Attitudes and behaviors lead individuals to think, be, act. First, we move from being comfort centered to being results centered; Second, we move from being externally directed to being more internally directed; Third, we become less self-focused and more focused on others; Fourth, we become more open to outside signals or stimuli, including those that require us to do things we are not comfortable doing. We believe a successful leadership framework supports an inspirational future moving outwards from the essence with clarity. It has resonance with all stakeholders while facilitating people and business growth. The polarities are well connected: outer and inner directed, pragmatic and dynamic, past-present to future, purpose and strategy. Such a framework generates a roadmap to achieve both personal, team and organizational goals congruent with values, capability, behavior and output required to drive business. Everyone can be a leader; with self-awareness, self-confidence and self-efficacy they can develop their own leadership expression dependent on their DNA, their mindset, cultural influences and their experiences. Self-Awareness Skills: Building strength and inherent talent; looking at supportive and debilitating behaviors; perceptions of self and others; personal drivers and life needs. Conceptual Skills: Distinguishing between fact and opinion; understanding the ladder of abstraction (walking down from lofty abstractions to understandable, communicable, doable, measurable, ground-real, tasks/projects). Solution Finding Skills: Shift problem focus to solution focus at all times. Literary Skills: Distilling the essential wisdom from the books in the recommended reading list; preparing reviews and sharing the knowledge within the Company. Performance Skills: Designing new projects that have great value for the organization and executing them in real time with the help of organizational mentors; measuring results and presenting to the top management. Supporting leaders to create a “Signature Presence” discovered through greater clarity in the Essence of Foundational Leadership. The Self-leadership approach promotes experiential-action learning and is designed to allow executives arrive at the core of their power. Through effective processes and coaching, the inner drive will reinvigorate their consciousness to shift them from transactional to transformational leadership better equipped to tackle challenges. Executives will arise with renewed vigor and this transformation will speed up the organizations growth pace. Given the complexity of organizational needs, deep customization determines the formats to bring about the desired state. However, some programs which can be partially customized (80/20). Contact us for more details. I’ve Made It endowed with exceptional insight into organizations, leaders and teams, and a deep understanding of our clients’ culture, values, and business priorities. Our corporate clients span Canada, India and USA, and range from entrepreneurial start-ups, to multi-national public companies. Over the last decade we have created a reputation for the highest quality program delivery, coaching and a premier global client list. We take great pride in our consistent track record of results, and the enduring, collaborative relationships that we have built with our clients. "I have had the pleasure to work with Anita on a number of projects over the past year. She has been a strategic and long-term partner to our pharma division in India. Anita has assisted us in developing a vision/mission and also leadership, intercultural management and performance skills training for all employees. .She has also been a coach to the senior global leadership team based in India. I highly recommend Anita as a consultant to any company due to her professionalism, commitment and passion for her projects. She excels in driving behavioural change to increase team performance. Anita challenges teams to think differently, helps identify development needs and plan for improvement."